It’s not exactly that I can’t keep away from the place, more a question of me being like a dog-with-a-bone once I’ve started something, being in ‘Town’ Christmas shopping that day anyway and an itching, burning curiosity I couldn’t quite shift to see what use that last delivery of steel had been put to in the intervening week – even if it was Christmas week and I didn’t have to be at school. I knew the site was due to close down for the holidays on Christmas Eve, but, as I turned into an unseasonably sunny Tankerville today, everything seemed very quiet – and I mean very, VERY quiet indeed. The site is very quiet: all closed down for Christmas now. 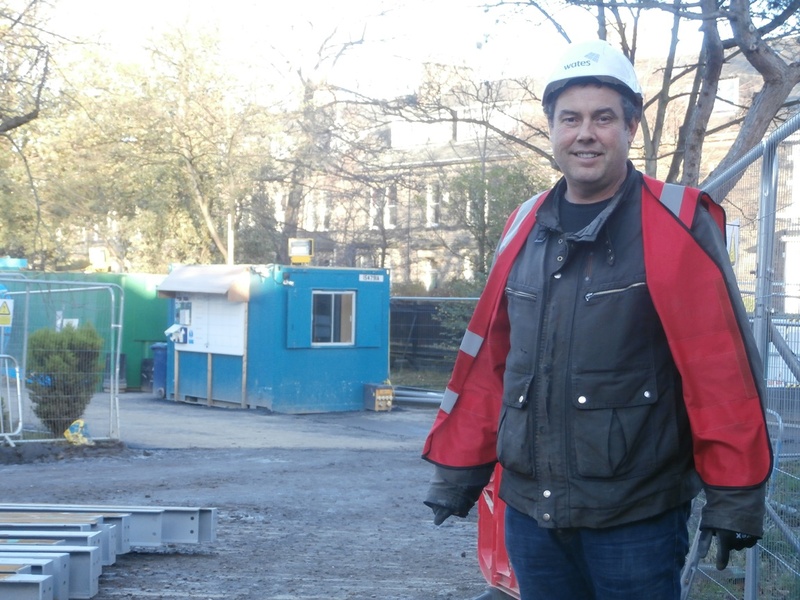 Fearing a totally wasted journey, I breathed a sigh of relief when I got to the old Junior School gates and, despite being faced with a totally inactive site in front of me, I spied Peter Wilson, the Wates’ Gateman, patrolling the far perimeter of the new build structure. The main workforce had indeed gone home at 11.00 am, but Peter and a colleague were still on site as watchmen until the 24th. Phew! Peter Wilson, the Gateman’s cabin and yet more steel. My journey hadn’t been in vain after all and, thanks to the light being extremely good and the site so empty, I was able to capture some very clear images of the completed concrete floor of the new build. 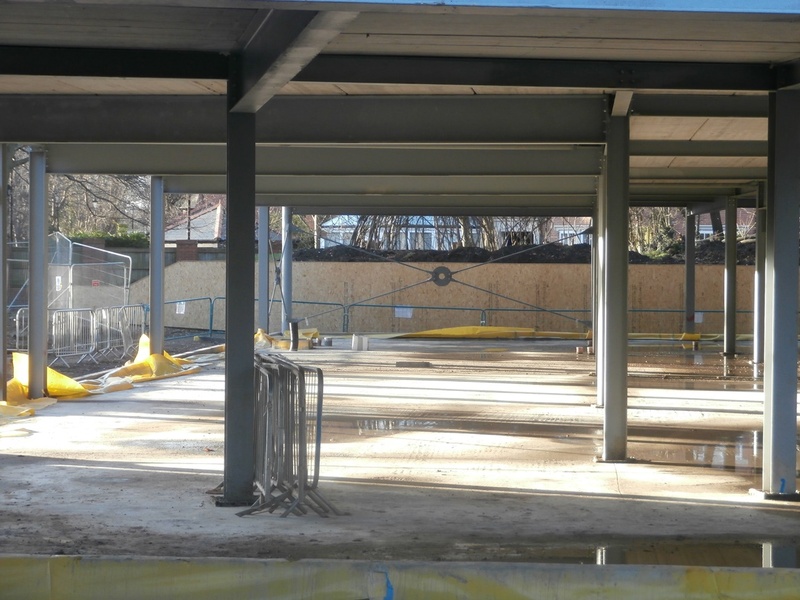 The newly concreted last section of the new build floor. Always a busy man owing to the heavy site traffic on a weekday, Peter had more time to talk today to explain both the recent work undertaken and what was next on the agenda for January. Without him there to point it out, I probably wouldn’t have noticed the outline of a pile of yet more grey metal at the far end of the new build structure. This, it turned out, was the first delivery of roof. Roofing material piled up at the far end of the new build. But what I had really come to see was over to my left. 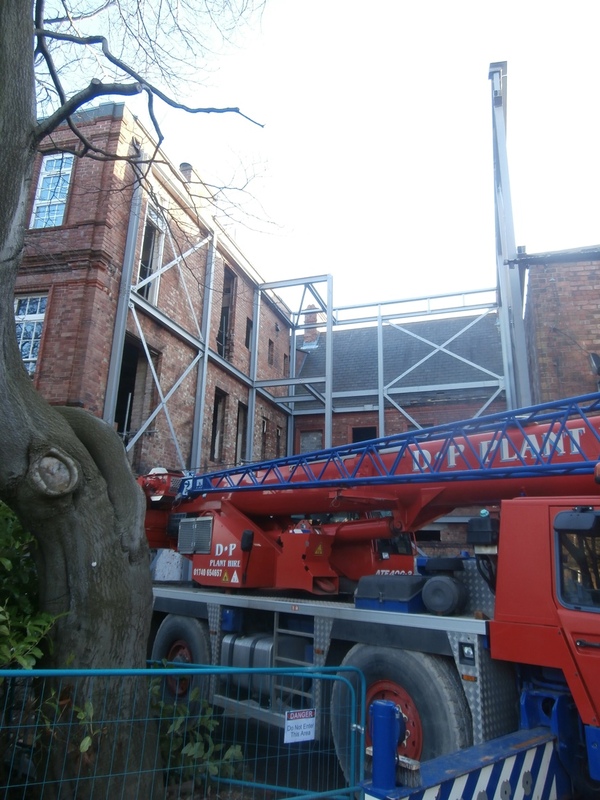 The red crane may have been all packed away and the lorry’s body reversed hard up against the open section of the old building – presumably as a safety measure while the site was standing inactive over Christmas and New Year – but it couldn’t disguise the fact that the structural work on the new extension had progressed impressively in a week. 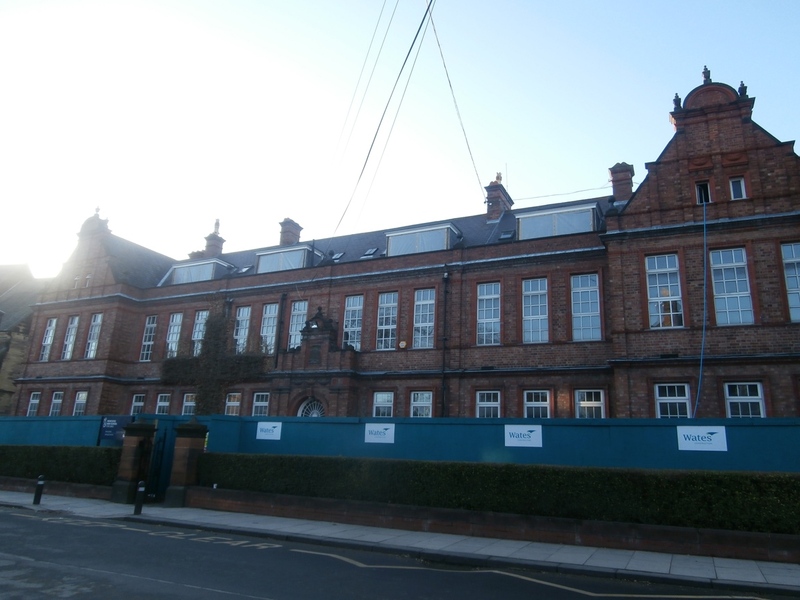 My first view of the new structural work on the old building – despite the red lorry. 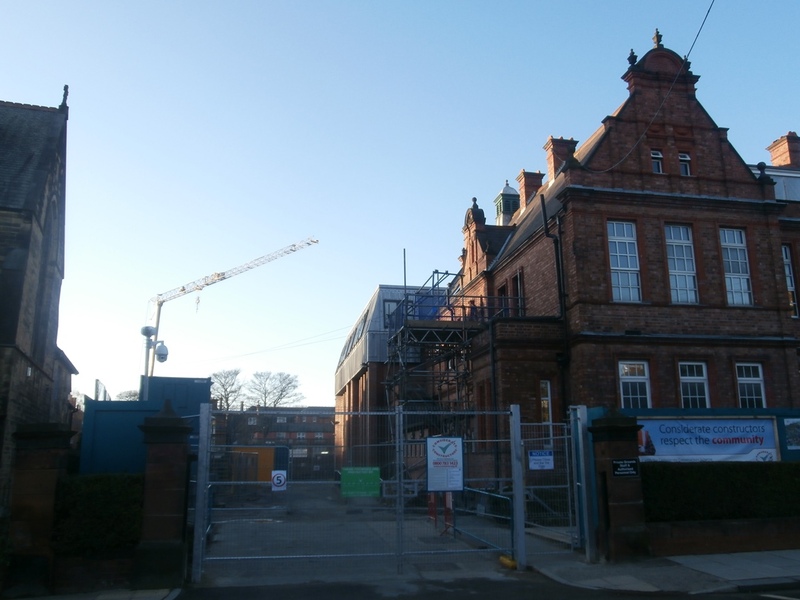 Even though I had been around when the new Food Technology and Art Wing was added to the Church High building in the late 1990s, the construction work underway then was always well-shielded from view – though we were certainly aware of hearing it! 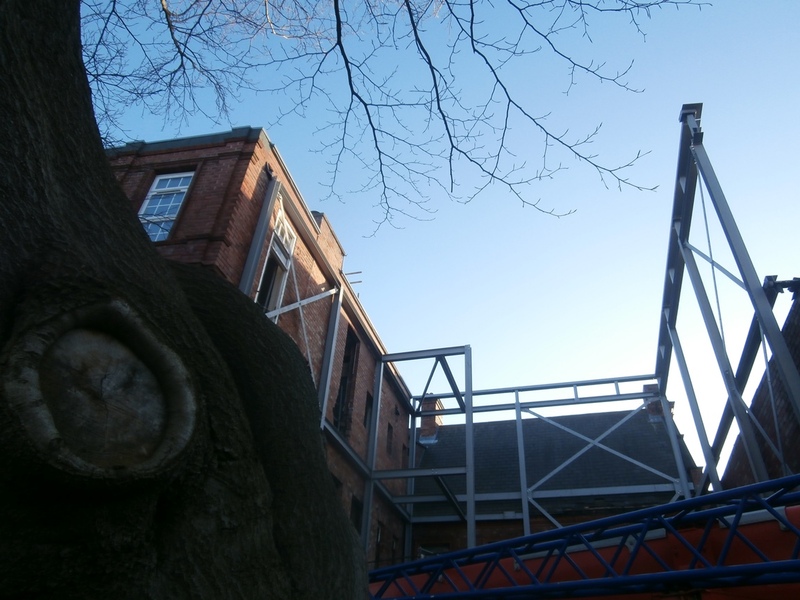 However, this new addition was thrilling to see at close quarters – particularly because of the way it slotted into the old building’s structure. A perfect marriage of old and new design, side by side. 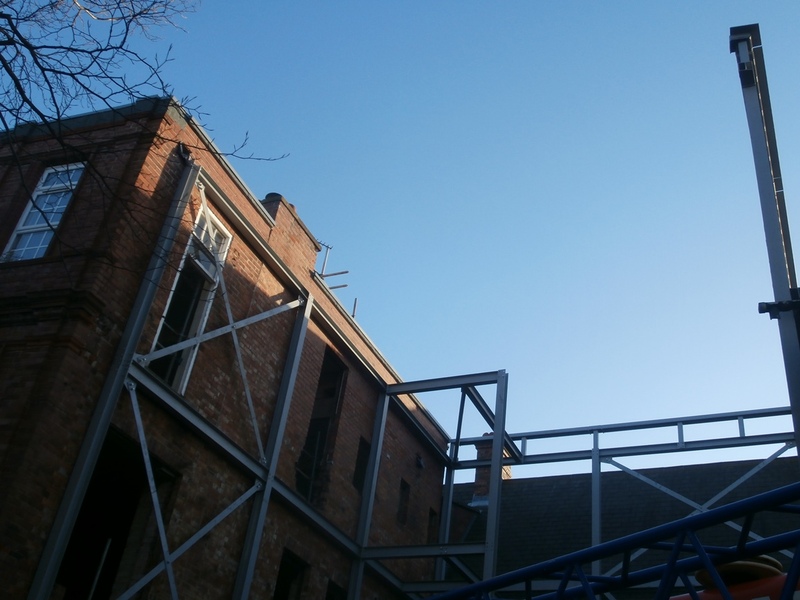 Clear view of the new extension steel frame against a bright blue sky. Who’d have thought it was late December? 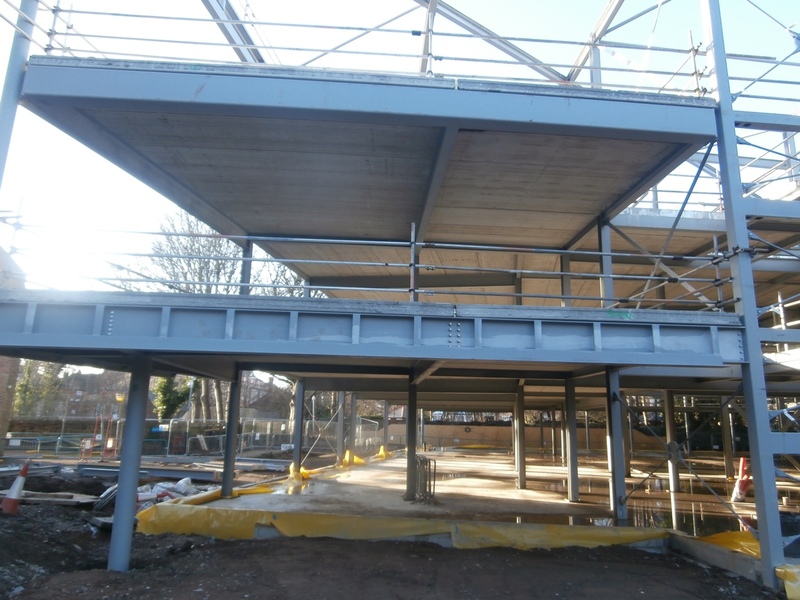 Until now, I hadn’t fully appreciated that the top of the steel frame would be flush against the building on one side and free-standing on the other, although I should have been. The third floor of the 1930s Library extension had, of course, been a slightly later addition. The rooflines behind looked slightly incongruous at the moment, but I am sure this will all be sorted out as the work progresses. From the positioning of the thin metal cross-pieces on the far left of the structure, it was now possible to start hypothesising which of the old exterior doorways and windows would soon be bricked over. Indeed, as the old Church High staff areas on both upper levels are destined for classrooms in the future, would any of them remain? As this is a circulation extension, a lift is also included in the plans. 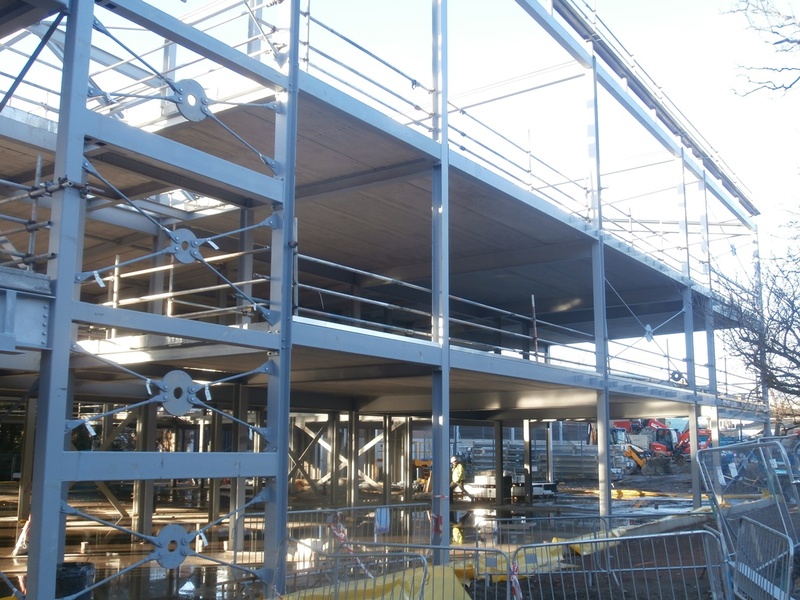 The short, jutting-out section of steelwork to the left towards the back is clearly where the lift shaft will be positioned, facing the new stairs. The beginnings of the lift shaft can be seen to the left. 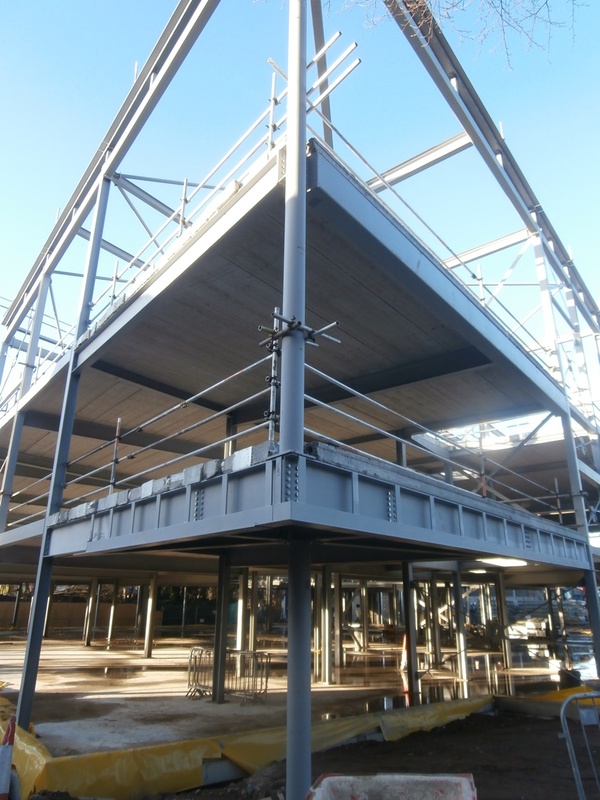 Turning around to leave, the corner of the new build structure was framed against the blue sky like the prow of a large ship. It made a most striking image. I was very glad I had come today. 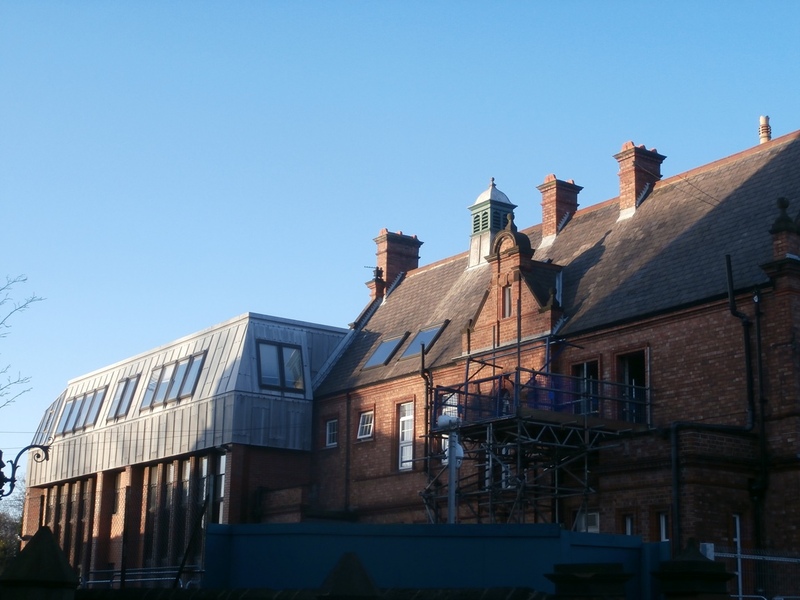 A striking view of the corner of the new build which faces onto the main building. As I left Tankerville heading for home, over my shoulder the old building was still bathed in sunlight. Admittedly the sun was low in the sky, but it was hard to believe Christmas was only 2 days away. Behind me the old building is still bathed in low sunlight. Finally got round to looking at this, Christine. Good to be ‘on board’ though!